Sort the catalog by clicking the column headers. Click on a title to see more details, including reviews and a sample. Click on an author to read their bio. All links open a new window. Please note that PayPal or a credit card may be used to order online. You can also pay by check, payable to Moon Pie Press, 16 Walton Street, Westbrook, ME 04092. ALL PRICES INCLUDE POSTAGE AND HANDLING. ...His subjects range from girls with iPhones to wild turkeys under the bird feeders on a morning in Maine. He can be nostalgic--musing on exotic places he's lived "when [he] was a nomad,"--or philosophic, concluding that "our destination is/inside us, the marrow, where we began." No matter the topic, he always gives his reader something interesting to consider and since he has been practicing the art of letting go, he won't mind if you take these poems out into the world and read them to your friends. 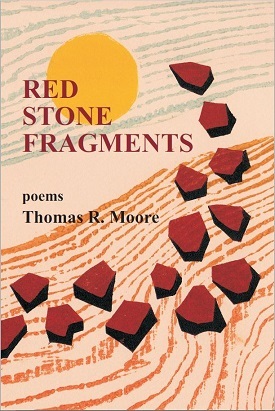 ...Wrenching loss permeates the collection, but elegant poems gleaned from the keen observation of nature and of art provide an inspired leavening and firm grounding in place, where wild turkeys "stretch and bounce to reach/the barberries like thieving boys." darkened by the streetlight’s blare. gouged skins. Gardening’s almost done. slosh and eddy between ledges. The reek of salt spray heavies the air. with me on a summer afternoon.